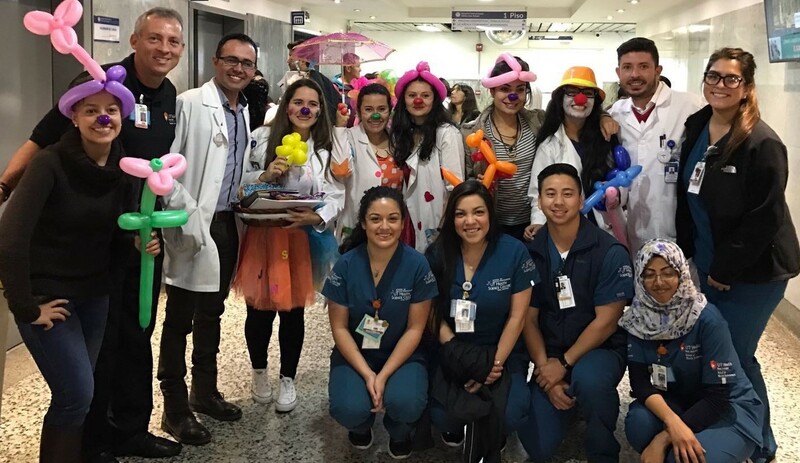 Ivan Dominguez won’t soon forget the pediatric patients with neurological conditions he met while visiting Colombia last month as part of a student cultural exchange trip organized by the School of Health Professions. Dominguez, a first-year physical therapy graduate student, was one of the group of 16 students who traveled to Bogota, Colombia last month for the trip, which was sponsored by Universidad Manuela Beltrán. School of Health Professions David Henzi, Ed.D, associate dean for academic and student affairs and Ruben Restrepo, M.D., RRT, FAARC, professor of respiratory care, accompanied the group of students which included 14 from the School of Health Professions and two from the School of Nursing. The group’s itinerary for the March 11-19 trip included academic and clinical experiences as well as recreation. Students attended classes at the University and clinical rotations in hospitals and other settings. Respiratory care master’s student Kristopher Tran most enjoyed visiting different hospitals and was inspired by the resourcefulness of the respiratory therapists he met, who provide a high level of care despite staffing shortages and limited resources. “This has encouraged me to continue to find ways to improve the quality of care that I deliver to my patients,” Tran wrote in an email. Dominguez was struck by the integration of alternative medicine into the physical therapy interventions he observed in Bogota. Overall, he believes learning about healthcare in another country will enhance his ability to relate to patients of diverse backgrounds.